MCT Events shall hold the first FUNtasTECH Warehouse Sale on March 1-3, 2013 at the New Megatent in Libis, Quezon City. 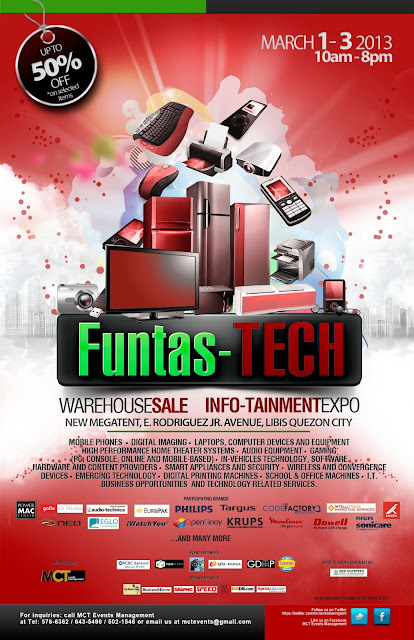 This unique sale and expo event is open to techies and the general public from 10AM to 8PM. The event will showcase products and services in the “Info-tainment” Technology industry, including novel and traditional ones in Telecommunications, Mobile Phones, Digital Imaging, Laptops and Computer Devices, High Performance Home Theater System, Audio Equipment, Gaming (PC, console, online and mobile-based), In-Vehicles Technology, Software, Hardware and Content Providers, Home Appliances and Security, Wireless and Convergence Devices, Emerging Technology, Digital Printing Machines, School & Office Machines and Technology Related Services. 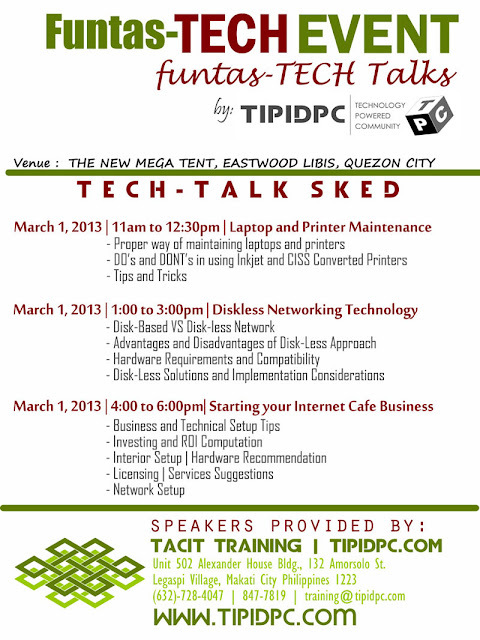 · Tipid PC is the premiere portal for trading buying, selling and swapping computers, computer accessories and IT related services in the Philippines.Aside from being a trading portal, TipidPC.com likewise serves as an online facility for interaction among its growing number of members. · TPC Lente is the official point-and-shoot digital camera users’ support and photography section/forum of TipidPC with more than 8,000 followers and members. · GDAP is a leading trade association in the Philippines, established in 2007 to represent and promote the country’s game development industry. Its members create and publish interactive games and entertainment content for various platforms. · Collectibles Unlimited Association is a non-profit association based in Metro Manila, whose main objectives are to promote interest in the collection and display of all types of comic books, toys, movies, animation, games and related childhood memorabilia; and to maintain a network of collectors to help members keep in touch with each other and advance the collecting hobby. · Anime’ Alliance Asia is a non-stock and non-profit organization that provides capacity-building services to Japanese culture groups in Asia, such as costume play hobby groups, bands, manga artists, animators, and toy creators. The group provides result-driven consultancy, technical and skills training services. 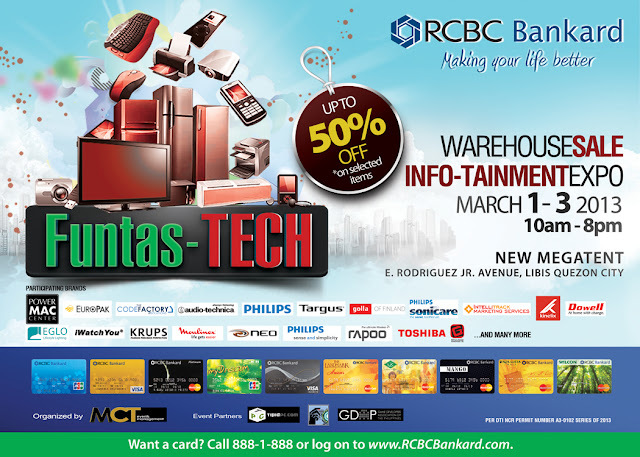 RCBC Bankard, the event’s OFFICIAL BANK PARTNER and will offer credit terms for a maximum of 24 months 0% interest to their credit card holders on purchases made during the event. However, all major credit cards are accepted, including Visa, Master Card and JCB. Also, RCBC depositors and members of the Yuchengco Group of Companies are entitled to FREE admission in the event. YES you can take better photos even with the most basic digital point and shoot model! Take advantage of the FREE DIGITAL PHOTOGRAPHY FOR THE LAYMAN Seminar to be conducted by TPC lente during the FUNtas-TECH Warehouse Sale: An Infotainment Technology Expo on March 2, 2013, at 1:00 p.m. in the New Megatent, Libis, Quezon City. Pre-registrations will be accepted only until 5:00 p.m. on March 1, 2013, but subject to availability of seats. 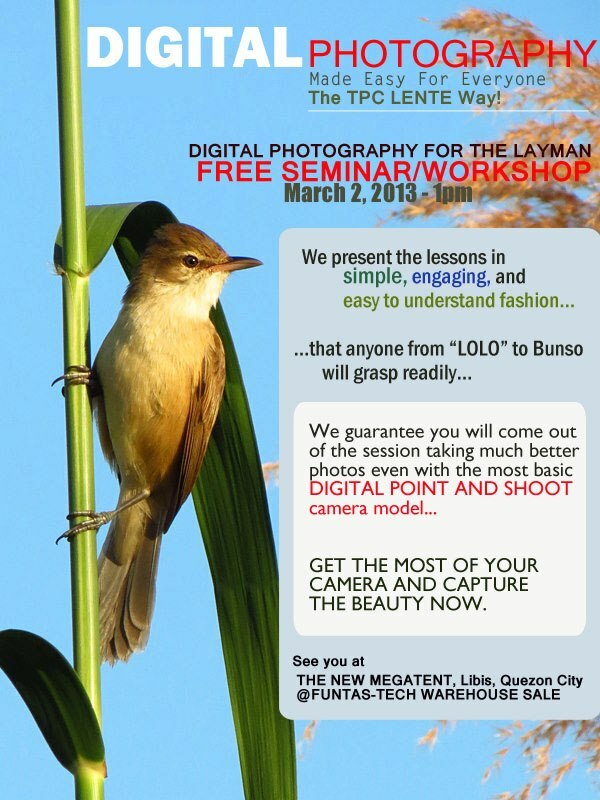 Pre-registered participants will be provided reserved seats during the seminar on a first come, first served basis. However, they must come to the seminar venue and sign the Registration Form in person latest 12:55 p.m. on March 2, 2013 else their reserved seats will be opened to walk-in participants. MCT Events is a leading events management company that specializes in designing, packaging and implementing memorable and high-impact corporate and social events. For inquiries or assistance, please contact 502-1546/ 339-2935/ 576-6362/ 643-5490.
thanks for sharing the post here with us but i have no interest in sale..3D virtual world kids.